Just as we thought we'd negotiated a safe landing back to earth for our talent-challenged sourcing advisors, that we discover another mismatch between perception and reality - they just love service providers. Are some advisors simply out of touch, or are too many buyers suffering from stagnating relationships? One of the quirks of the services industry that has long-bothered me - and many others - are the cosy relationships some advisors clearly enjoy with some service providers. 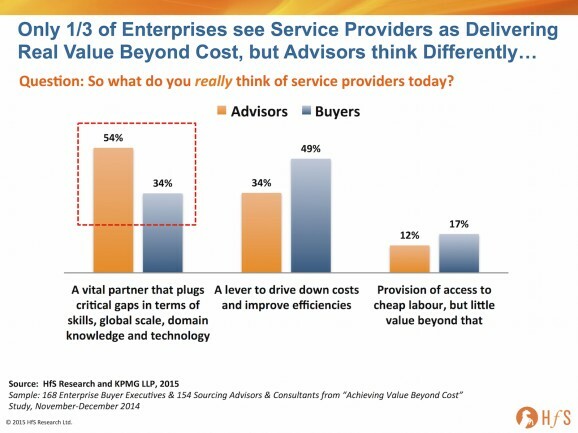 However which way we look at this, one thing is clear - most buyers (49%) which have to live with their service providers everyday, predominantly view them as efficient partners to drive out cost and improve operations, while a third actually see them as having the ability to be real transformational partners (34%). Which isn't too bad as only 17% view them as body shops... but clearly room for improvement, in terms of more buyers enjoying higher value relationships. 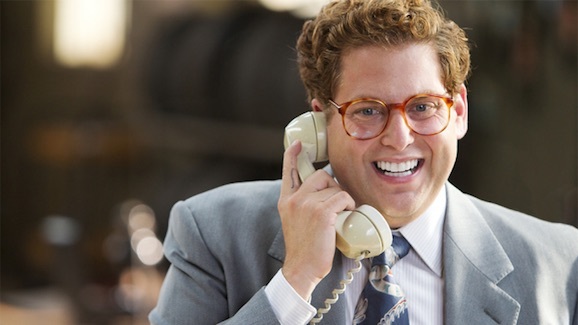 So why, pray tell, do a whopping 54% of advisors think service providers are simply just wonderful? Do they only talk to the happy 34% of clients? Do they talk to more than a couple of clients a year? Or are they so submerged in the schmooze-fest of service providers showering them with booze, Disney World, the same old client still droning on about his incredible 2007 process transformation, and hoards of white papers and books that have really cool titles, but quickly land in the trash can, that they've lost all touch with reality? Firstly, I know many brilliant advisors - and often call on them to chat about the industry, share views and ideas etc. We even invite a selection of clever ones to our Blueprint sessions to add to the debate. But this gap between perception and reality is clearly too great - I could expect maybe a 10% delta between buyer and advisor, as many relationships struggle because of the buyer's failure to entrust their provider with higher level work, but a delta of 20% is simply too great. Quite simply, buyers are getting smarter and those with real experience want direct, honest conversation when they spend a lot of money on consulting services. With so many enterprises, today, struggling with talent shortages and rising complexity of their needs, we need advisors steeped in reality who can give them a nice big dose of reality, who truly understand what life is like a few years into an outsourcing engagement. This is why many advisors need to be better informed - they need access to governance data, unvarnished research. They need to listen to many, many clients talk about their experiences and start asking the tough questions of their service provider buddies at their champagne receptions. The backslapping needs to tone down and the real conversation needs to begin in ernest. Phil - It's all rather straight-forward. Providers and Advisors feed from the same trough. They both know that their fates are tied to the general confidence in the central thesis that outsourcing is an effective operation model, albeit complex and requiring specialist advice to construct. To be candid, I was much more of a proponent myself prior to being dipped into the reality of delivering on the promises made during a sales process and the associated fragmentation of service commitments into bespoke instances. I wonder what happens if you ask the same question to Hfs analysts. Do they believe service providers can truly deliver value, or if they are merely a cost cutting tool? Isn't it simply true that a group of service providers, quite a bit of them actually, is able to deliver true value, but that most customers mainly look to their SP's for cost cutting & control (and then even often blame them for not delivering business value)? So it wouldn't surprise me if Hfs analyst's response would mimic the advisor's response. Give it a shot, do the survey! @Peter - My take is the real ratio is somewhere in the middle of the advisor and the buyer. A third of buyers view providers as value-enablers, and I estimate another 10% would be in this category if they gave up more to their provider and admitted part of the problem is their inability to trust. The 50% viewing them as efficiency players is right on the money - that's what these clients want and pay for, and that is what they get. The challenge for these service providers is to prove they can really do more than efficiency and cost-takeout. Interesting statistics, not sure the issue is the service provider and advisor relationships, contributing factors to the dilemma could be: a) Advisors like service providers today need to compete with each other in a procurement cycle and spend less time with the CXO suite then before. b) These are more questions: Where do most advisors go to gather research? Do they have budgets invested with the analysts community? Or is the focus and time spent on the expectations of the client and the deliverables as defined by procurement?